Go back to a time when cars were not around. There were only dirt roads, and if you wanted to get somewhere you either walked or rode your horse. Fashion was not an important part of life during this era, but so many people in today's world yearn for the things that remind them of simpler times. The Selvaggio Handmade Full Grain Heavy Duty Leather Travel Messenger Bag & Backpack looks like it came straight from that era. Notice how the leather has a worn appearance. There is a sophistication about this bag that brings it to life. The full grain leather really is the main characteristic to this bag. From the front you will notice several straps. There is one long strap that can be used to carry the messenger bag over your shoulder or cross body style. In the middle of the strap is two cushions which helps give your shoulder some comfort when carrying a heavy load. This bag also has a short carrying handle which is great when you need to grab it on the go. The most unique feature of this heavy duty leather briefcase is the fact that it can convert to a backpack. The conversion is performed by unhooking the long shoulder strap. Once the strap is unfasten from the sides, run it through the loop on the back of the bag. The loop is near the top carrying handle. To finish off the conversion, hook the ends in the loops that are located near the bottom of the bag. Three easy steps, and your messenger bag is now a hands free backpack. So, you don’t have to switch bags when you go from work to your day out with your friends. It’s perhaps one of the most versatile handmade leather briefcases out there. There is a strap that runs vertically down the front of the bag and fastens with a quick buckle. This is the main closure of this vintage bag. The two straps that are fasten on the top portion of the bag can be used as an extra closure by fastening them with the buckles located on the front. There are two open pockets located on each side of the bag that can be used for items you need to access quickly. Once the flap is open, you will notice precise organization that Serbags gave this bag. There are two large sections which can be used to store larger items like books, files or a laptop. On the section divider there are two deep pockets. 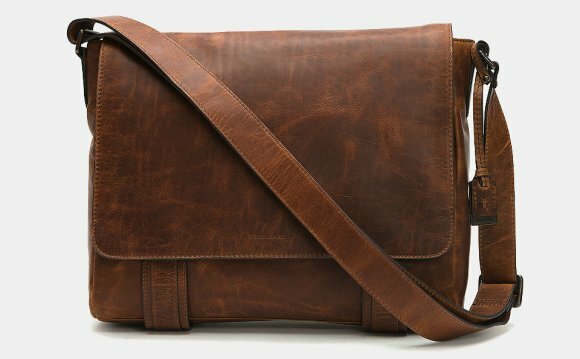 The quality of this handmade leather messenger bag is outstanding. This bag has both a vintage and sophisticated feel to it. Two worlds have collided to make one magnificent piece of art. As far as handmade leather bags go, this one has it all. It’s sturdy as you would expect a rugged leather briefcase to be. But at the same time, it’s elegant as only a Selvaggio leather briefcase can be.